Over 90 years later, silent film The Kid Brother works well as entertainment for modern audiences, for whom its calculated old-fashioned corn and apparent simplicity aren't a problem but par for the course. 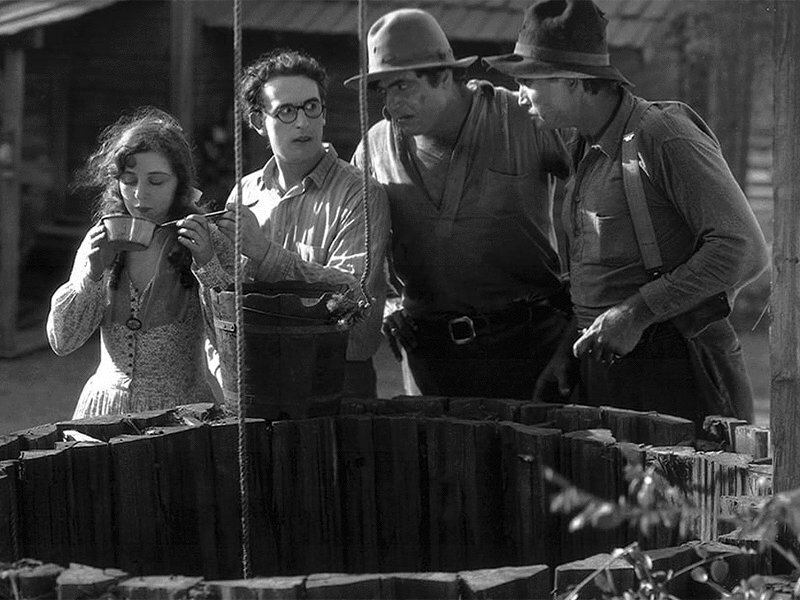 Harold Lloyd's The Kid Brother (1927) is a beautiful bit of bucolic comedy, equal parts innocent romance and "local boy makes good" with a sidestep into near-horror, that's now spruced up in a sparkling shot-yesterday 4K digital restoration for Criterion's Blu-ray. Still wearing his eternal empty glasses -- the only aspect of Lloyd's "spectacles" to be empty -- Lloyd plays Harold Hickory, a relatively scrawny if plucky backwoods yokel laboring as de facto housewife in an all-male family of strapping overshadowers. His pa, Jim Hickory (Walter James), is the sheriff and town father of Hickoryville, with the accent on "hick". Harold's older brothers, Leo (Leo Willis) and Olin (Olin Francis), are equally hulking farmers just this side of bullies, and sometimes crossing to the other side. All conduct a relationship to Harold somewhere between tolerance and dismissal, as he's consigned to housework drudgery while they chop down trees and perform other manly pursuits. Little noted or respected, he hovers around the edges of consequential family gatherings and tries to fit in. The viewer can see Harold's ingenuity from the start, as he devises unlikely labor-saving methods of doing the laundry (this involves a butter churn and a kite) and drying the dishes (with a net, the stove and a plank). The laundry angle introduces an early cross-country shenanigan in which he bests a surly neighbor played by Ralph Yearsley, who played a similarly negative role in Henry King's Tol'able David (1921), a huge hit of idealized Americana whose parallels the 1927 audience would have been expected to recognize. As one critic points out in an extra on the disc, Lloyd's film also remakes a less-remembered comedy, Hal Roach's The White Sheep (1924). Harold's romantic interest is introduced before Harold. Jobyna Ralston was the third of Lloyd's long-term leading ladies, as placed in context by the bonus discussion between historian Cari Beauchamp and Lloyd granddaughter Suzanne Lloyd. Ralston's roles change personality and context from one film to the next, not unlike Lloyd's roles, and here she's introduced as Mary, a waif traveling with her late father's medicine show. Still mourning her father, she'd prefer not to be there, but she's been smooth-talked by new boss Flash Farrell (Eddie Boland). Filling out their trio is Sandoni (wrestler Constantine Romanoff), a tall bald strongman whose initial function is to make creepy advances on Mary. After a case of mistaken identity leads Harold to give permission for the show's performance, he finds himself publicly humiliated before village and family. The only bright spot is his rapidly developing romance with Mary, whom he encounters in a scene with one of his trademark "climbing" routines. The camera, on an elevator platform, rises with his ascent up the limbs of a tall tree in one of the movie's most beautiful and charming moments. A lengthy section involves much carefully calibrated business about Mary spending the night in the family cabin as Harold feuds and fusses with his brothers. Although never as strong as they, he's continually shown as more clever and achieves a trickster's aplomb at his best moments. Another element in the film's favor is that, even though Harold's family is often at odds with him, they're presented as having their positive angles as well, which underlines how desirable it would be for Harold to be accepted fully into their circle. A simmering subplot finally comes into play involving missing funds, and it turns out that despised weakling Harold, the family disappointment, must save the day amid hair-raising danger. The big setpiece takes place on a marvelous wrecked ship, the Black Ghost, that seems to have been created for picturesque purposes as a village attraction and is introduced in a stunning matte shot as the medicine show wagon passes it. The gags in this section are funny, inventive, surreal (get a load of that capuchin monkey) and, with sinister lighting effects and dramatic reversals of fortune, even frightening and disturbing as Harold alternately hides from and battles with the menacing Sandoni. 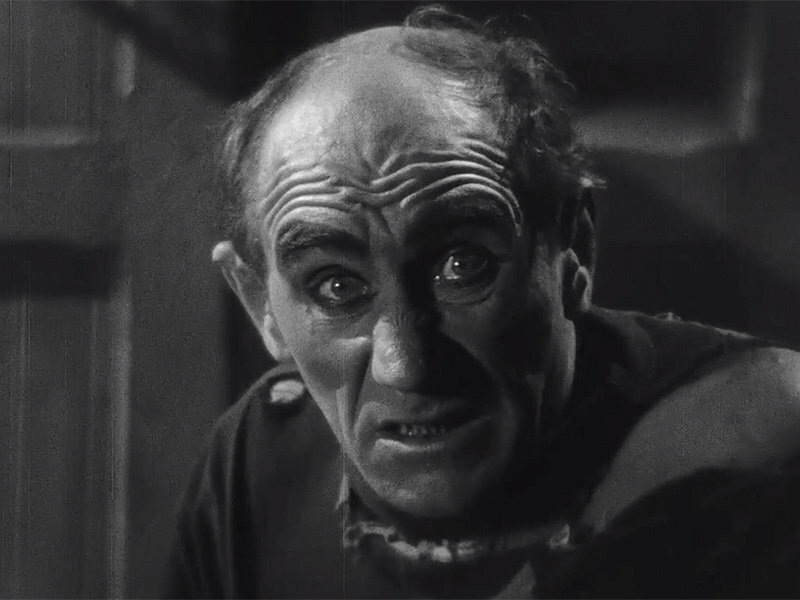 A particularly canny choice is the fact that the ship's tilted surfaces create their own "Dutch angle" effect, as exploited by director and gag-writer Ted Wilde with input from co-director J.A. Howe. Throughout the film, Wilde's choices with photographer Walter Lundin are effective and even lovely, as the camera pans and dollies with grace to milk or reveal a gag or a danger or both at once. The evidence of this film and Lloyd's next, Speedy (1928), is that Wilde was a good director, although Lloyd was boss. In between, Wilde directed a lost vehicle for Babe Ruth and later made two 1930 talkies (see "Ruining Their Reputations: Pre-Code Movies Have a Naughty Reputation That's Not Always Deserved, PopMatters, 1 Jul 2012). In the extras, critics mention that Lewis Milestone was originally hired to direct but walked out in disgruntlement over the fact that Lloyd was clearly in charge. Yes he was, and Lloyd knew what he wanted and what worked for him. Lloyd's business sense put him firmly in control of his own career and ownership of his films, as he discusses in a 1962 interview for Dutch TV included among the bonuses. Unfortunately, original negatives or prints of some of his films were lost in a fire, which is why two rare shorts tossed in among the extras had to be preserved incompletely from copies found in non-standard film formats: Over the Fence (1917) and That's Him (1918). The first involves baseball and the second has lots of running around. Other extras include video essays on the locations and the monkey gag; a tour of the Lloyd estate and the friendly commentary, both retained from a 2005 DVD; and a choice of Carl Davis' 1989 score or a Wurlitzer organ score by Gaylord Carter. Over 90 years later, The Kid Brother works well as entertainment for modern audiences, for whom its calculated old-fashioned corn and apparent simplicity aren't a problem but par for the course. Harold achieves his cathartic redemption amid a reasonable portrayal of small-town suspicions, gossips and rivalries, not to mention action-packed cross-cutting at the climax. If this movie doesn't boast the jaw-dropping stunts of some of his other classics, it also skips their occasional bits of blackface or minority humor, and it's refreshing not to be reminded of the era's sociology so baldly.